Abstract: Aggressive fibromatosis (AF) is a rare benign tumor, which occurs in the deep part of bone and muscle fibrous tissue. Clinical and pathological features can be challenging for definitive diagnosis. Here, we report a rare case of a large AF in the axilla. Interestingly, 18 F-fluorodeoxyglucose-positron emission tomography/computed tomography showed significant increase in standard uptake value. 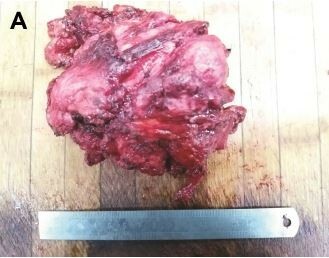 Surgical resection yielded a spindle cell tumor likely of fibromatosis origin which was positive for β-catenin expression.